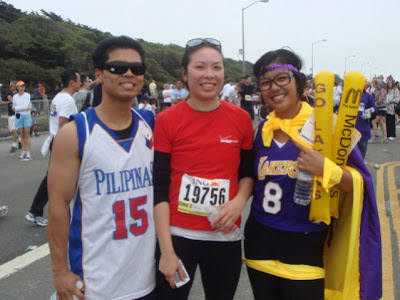 I’ve never done the Bay to Breakers before so when I heard Verizon was trying to set something up for employees to do it I decided it’s a great time considering I usually work Sundays. We met up as “the network” wearing our red Verizon shirts and hard hats. The streets were crazy as you can see and this was just somewhere by the starting line! Reg told me about the tortilla throwing in the beginning. I still don’t understand why, but it was fun. The “Jesus Christ Loves You” guy is always downtown. His normal post is on Market next to the cable cars. No pictures from the finish line though. My coworker that was walking held onto my bag. But I ran into Darrell and Rocks! Thanks for the picture Rocks!